Do you have the technical chops to be a startup marketer? Startup marketing requires a level of self-sufficiency that is more intense than most marketing roles. In many cases you’re simply given access to the bare bones of what’s holding the business together and told to drive user growth and/or revenue. This is when you either sink or you swim. I remember my first week on the job at Knewton. I was given keys to the same terminal that accessed our adaptive learning platform and told to work my “SEO magic” on the “marketing site”, a label that made sense, but somehow made me feel like a second-class citizen in this developer-centric environment. Welcome to a real technology startup. Our worth as a marketing team was definitely not a given. I did my best to pretend to know my way around the command line, only coming dangerously close to bringing down all the online test prep products we offered a few times. First I figured out how to hold my breath under water longer than usual. Then I learned how to tread water, and eventually I was doing laps, making a pretty big impact on Knewton’s marketing success over the next 3 years. Let me tell you… It was a STEEP learning curve. Thankfully I was surrounded by amazing colleagues who pushed me to raise my game to the level necessary to succeed; startup rockstars like Amy McDowell (now CMO of Updater), Robbie Mitchell (Knewton’s Director of Marketing), Eric Garside (Senior Front-End Developer at Knewton), David Liu (Knewton’s COO), Josh Anish (now Director of Content Marketing at Kabbage), Sri Viswanathan (now “Ops Monkey in Residence” at Betaworks), Pete Miron (now SVP of Engineering at Bitly), and many more. It took about 8 months to convince management that the marketing team could deliver results much faster if we could use a Content Management System instead of committing all of our changes to the site in the terminal via subversion control. With the help of the ridiculously talented Mark Jaquith, we ripped the “marketing site” out of the clutches of our ridiculously talented developers, and put it on Wordpress. Finally we were self-sufficient marketer, off to the races. Onboarding at Knewton as a marketer was a stressful time. Had my technical skills like HTML and CSS been better, I would have been able to hit the ground running on day 1. When you join your startup, you may be faced with similar challenges. If you’re marketing efforts are blocked by a lack of developer resources, sorry, but that’s your fault. You were hired to drive growth, so you better figure it out. Fast forward 4 years. Now I’m leading Technical Marketing at Startup Institute. If the above example didn’t convince you that you need to develop your technical marketing skills in order to be a highly effective marketing employee at a startup, hopefully this example will. 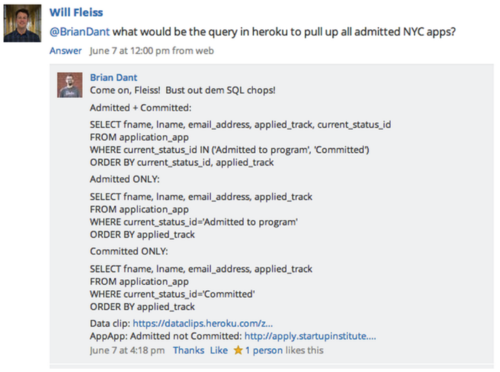 Here’s a real interaction on Socialcast between myself and one of our awesome web developers Brian Dant about how to pull a query from our database using SQL. If you think you have what it takes to be a startup marketer, start building your technical chops. The value you bring to a startup team will increase drastically, and your stress level in the first 6 months hopefully won’t be quite as high. At Startup Institute we’ve recognized the need for marketers to not rely on developers to get their job done. With the help of many successful startup marketers, we designed the curriculum in our Technical Marketing track to prepare people for startup combat as a technical marketer. In the first two days students dive deep into HTML and CSS, closely followed by implementing SEO best practices onto their own landing page and customized blog. We’re training students to be full-stack, self-sufficient marketers capable of helping a company increase their customer base by a factor of 10. Students learn relevant industry tools like Google Analytics, Google Adwords, HubSpot, Mailchimp, and others, along with SQL so they’re prepared when they drive 10x traffic to the website and need to do data pulls from your customer database. Feel free to reach out to me directly if you have any questions about the program or just want to chat startup marketing. My email is willf (at) startupinstitute.com. Early applications for our Fall program are due this Monday, 8/12.